Serviceberry stems and leaves are valuable as a browse for wildlife, particularly deer. The berries turn bluish-purple when ripe, and are juicy and tasty but pithy. The berries are one of the earliest fruits to ripen, and provide a staple food source for birds and coyotes. 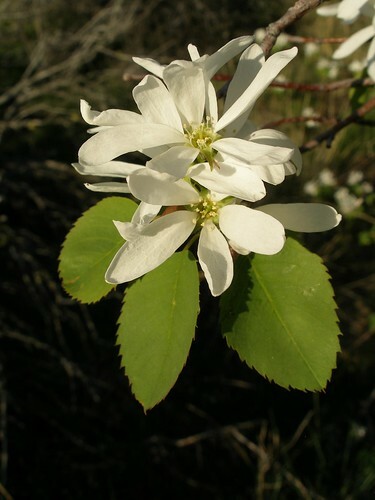 Western serviceberry was also a valuable source of food and tools for Native Americans. Its hard, straight wood was used for arrows, root-digging sticks, and seed-beaters. The berries were dried alone or squeezed into cakes and dried. The berries were also used as a sweetener for other foods. In winter, serviceberries were boiled to make a pudding or added to a stew. Hunters made a snack of a mixture of dried salmon and serviceberries.